I have been working with Upper Deck since 1997 and in that time I have been privileged to know a great many passionate sports fans. Being a sports fan myself, I know I’ll never be able to throw a precision pass like Peyton Manning; hit a curve ball like Ken Griffey Jr.; fire a slap shot like Steven Stamkos; or hit a clutch jumper like Michael Jordan. Or could I? Jordan has been offering adult basketball fans the chance to come fly with him at a camp he runs in Las Vegas each year. The MJ Flight School just finished its 14th annual camp and it’s safe to say that MJ left an indelible mark on those in attendance. 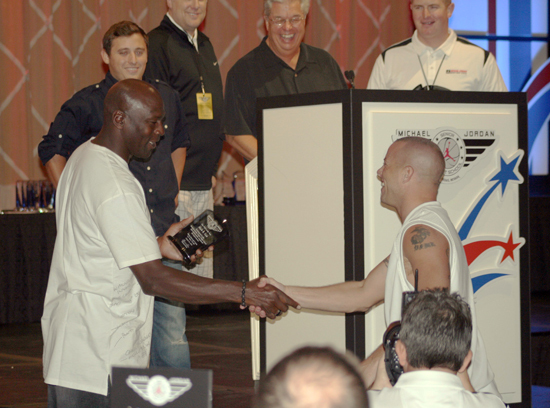 Mark Gott had the opportunity to get up close and personal with his idol Michael Jordan at MJ's Flight School in Las Vegas this month. One of the recent attendees was Mark Gott and he has been a huge fan of Michael Jordan since he was in junior high, back in 1987. Gott’s affinity for MJ’s skills led him to collect cards and memorabilia of Jordan, but more than that, he’s a huge fan of the Jordan brand clothing line. He has amassed more than 70 pairs of MJ branded shoes, slides and cleats. It seems his entire wardrobe is Jordan-related from the sweaters, polos, slacks and jeans, to the warm-ups, shorts and tanks. Gott estimates he has more than 400 different articles of clothing from the Jordan brand. During a flight eight years ago, Gott was perusing an in-flight magazine where he first read about the Michael Jordan Flight School. He was disappointed to find that participants had to be 35 or older to attend the clinic so he waited patiently for that special birthday to arrive so he could get the chance to meet his idol. Sadly the camp was canceled when Gott turned 35 last year, but this year his dream came true. Gott had been anticipating this experience for some time and he wanted to come up with a way to remember it forever. 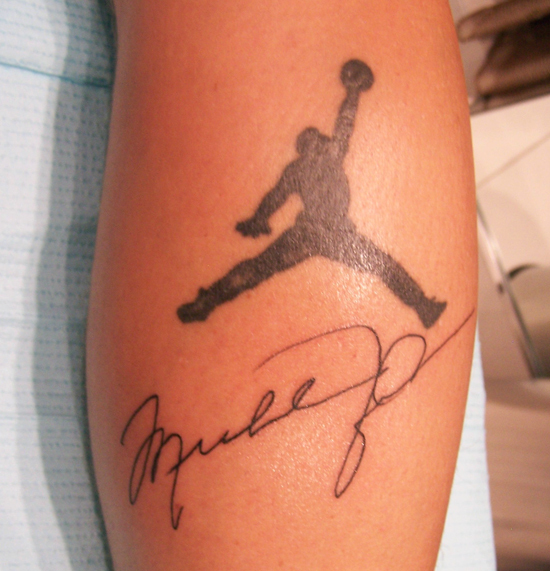 Gott had Jordan’s famous “jumpman” logo tattooed on his calf roughly eight years ago and as the opportunity to attend the clinic drew closer, he came up with a unique idea. 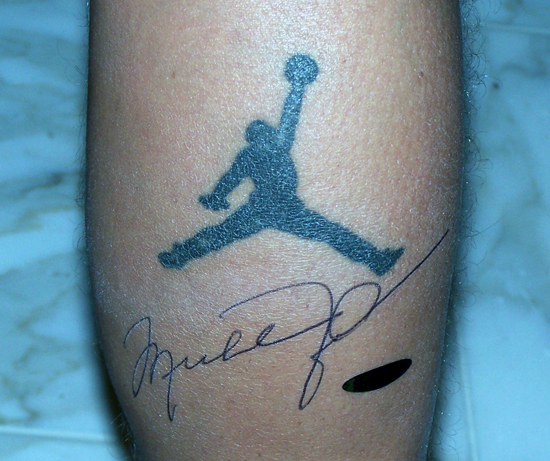 What if he could get Jordan to sign the area just below the tattoo and then have Jordan’s signature permanently tattooed so he could display the authentic signature forever? He was committed to it, but now came the tough part: Will Michael agree to it? Could you say no to this face? 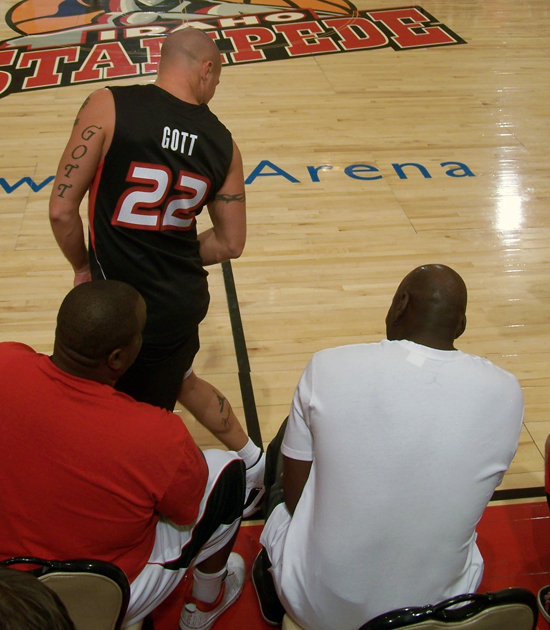 Neither could MJ as he agreed to sign Gott's leg after Coach John Thompson III asked. 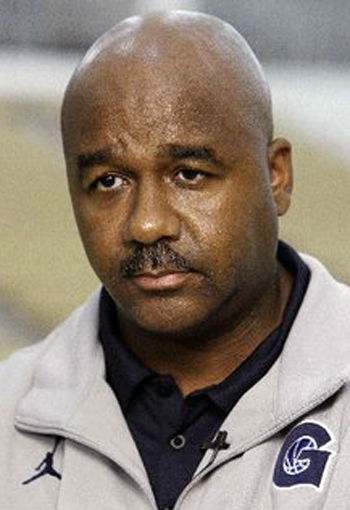 Rather than going right to MJ, Gott worked through one of the coaches at the clinic, John Thompson III. Coach Thompson worked his magic to help Gott accomplish his mission. The day of the autograph session that Upper Deck Authenticated (UDA) oversees, Coach Thompson came to Gott and let him know it was a “go.” Gott immediately shaved his calf to prepare for the signing. 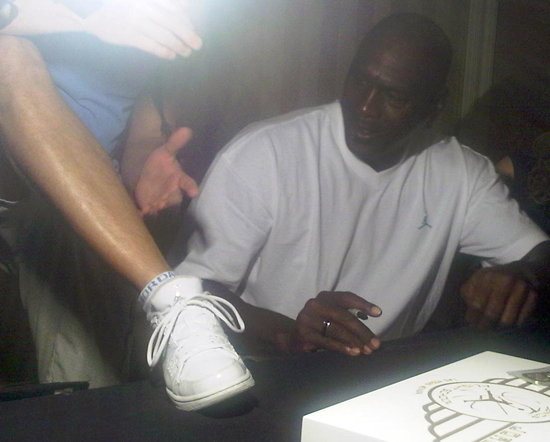 As Gott shares with Jordan where he wants him to sign, it looks like MJ is thinking, "You want me to sign what?" Gott held still as MJ provided him with a world class signature that would last a lifetime. On hand to authenticate and witness this first-ever body signing for UDA was Drew Mills. UDA's Drew Mills even affixed a hologram to Gott's calf to authenticate the signature. After Jordan delivered a perfect signature, a UDA rep was on hand to witness and authenticate the signature. But then came the painful part. Gott raced off to King Ink at the Mirage where tattoo artist Jasen Workman made the ink MJ has signed permanent. A signature that will never fade. Gott truly has a memorable keepsake from MJ. “Michael was really cool about the whole thing and was very interested the next day in seeing how the tattoo turned out,” said Gott. 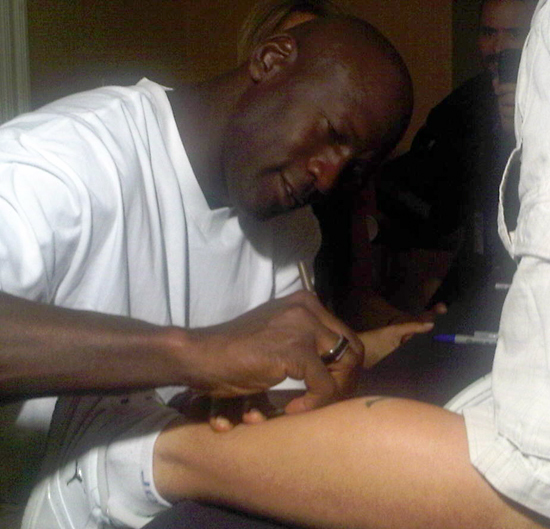 When Gott shared with Jordan that he thought the tattoo came out great, Jordan again responded with a smile, “Of course it did, it’s my signature.” They both shared a laugh and shortly thereafter one of MJ’s staffers who had been working with him for 25 years pulled Gott aside. He told Gott that in his time with Michael, he had never seen Michael do anything like that. Being the first made the experience even more special to Gott. The next day during the camp, MJ and others wanted to see how the tattoo turned out. Gott felt like a rock star during the remainder of the camp with others in attendance asking about the MJ tattoo and taking pictures with him. When he returned home, he was still in awe of the experience. His children thought it was extremely cool as well and they have been busy telling all their friends about daddy’s new tattoo. No word from Gott as to whether the tatoo has helped his jump shot, but the memories from the experience will last forever. Will UDA diversify its portfolio and expand into tattoo-signature authentication? Probably not. We are pretty happy with the Michael Jordan autographed memorabilia we are currently producing. This was likely a one-shot deal, albeit a special one that Mark Gott we will not soon forget. Cool Story, well written and funny. However, I have heard that Jordan is not that nice to everyone and sometimes he can be mean. Nonetheless, I’m sure it’s tough to be hounded 24/7 for autographs and be recognized the world over as probably the most famous athlete of all time and say yes to everybody’s request. interesting Chris. UDA should insert tattoo autos in packs…it would be cool to wear autos.